Last week I had to prepare a presentation for an audience with no glaciological background. 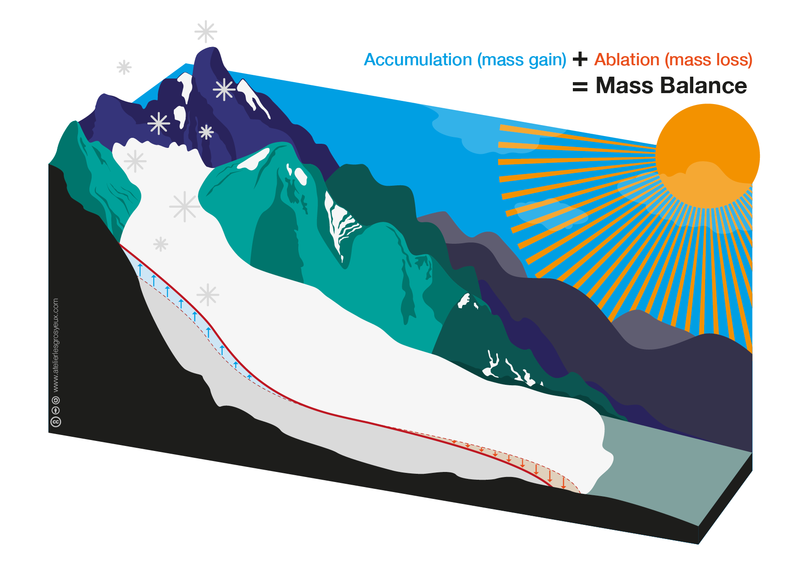 I wanted to explain some basic concepts of glaciology such as accumulation, ablation, equilibrium line altitude and mass movement in a glacier. Since I’m no good at drawing and I thought that such graphics might be useful for further occasions, I asked a professional graphic designer (who also happens to be my sister) to make a series of simple glacier graphics that I could click through while explaining the concepts. Although these are the first scientific graphics my sister ever made, I believe she made a really good job! Since these images might be useful to others, we decided to release them under an open license. You’ll find all these graphics (as well as some other plots) on a dedicated repository. Don’t hesitate to leave us some comments here or on Github! We’d love to hear your feedback as well as improvement suggestions. Thanks to Kevin Pluck from Pixel Movers & Makers we now have an animated GIF too! Glacier graphics for education and outreach was published on October 06, 2018 .